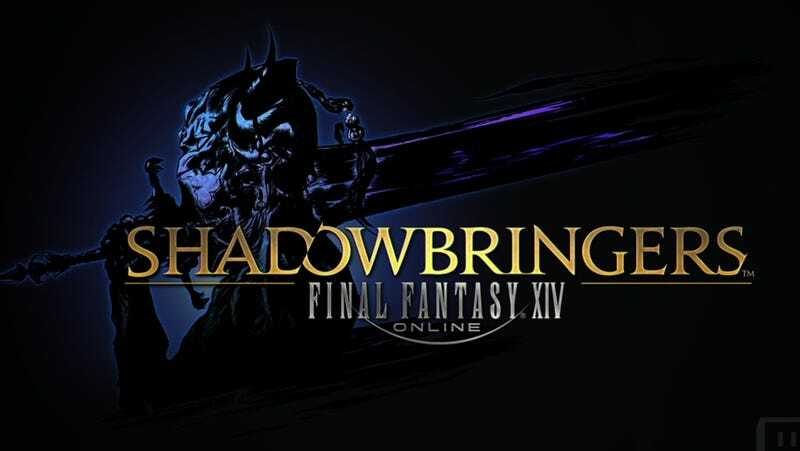 Announced today at Square Enix’s annual Final Fantasy XIV Fanfest, the popular online game’s third expansion, Shadowbringers, is coming early summer 2019. Expect an expansive story, a raised level cap and multiple new jobs—including one wielding a gunblade. And did somebody say playable Viera and Blue Mages? Now that players have freed Ala Mhigo and Doma in the Stormblood expansion, now it’s time to take the fight to the evil Garlean Empire. What will happen to the Warrior of Light and the allied armies? Who are the mysterious Ascians who have been messing with players since the game launched? Who is the Warrior of Darkness? These questions will be answered in the new expansion. Well, one will be answered in patch 4.5, in which we’ll find out why the Warrior of Light must take a darker path. While producer Naoki Yoshida could not give details on which new character jobs will be introduced in the expansion, he indicated a hint about one of them was present in the expansion’s teaser trailer. In said trailer, a character is seen wielding a weapon that is part gun and part sword, similar to weapons used by Final Fantasy VIII’s Squall. Then, towards the end of the keynote, Square Enix president Yosuke Matsuda came out on stage wearing a blue cape and holding a staff. Matsuda, overruling Yoshida’s decision to not name a new job, introduced a video announcing that the Blue Mage is coming to the game, but not in Shadowbringers. The Blue Mage job will be introduced in the game’s 4.5 update, far in advance. The Blue Mage will be a limited job, not connected to any other class. Players will learn monster actions through combat. When 4.5 launches, the Blue Mage will have a level cap of 50. Once Shadowbringers comes out, new patches will raise the Blue Mage’s level cap. The current cap for other jobs is 70, which is being increased to 80 in the expansion. Players have been demanding playable Viera, the rabbit race from Final Fantasy XII, for years now. Looks like it’s finally happening. Shadowbringers will also bring new primals to fight and beast tribes to gain favor with, including the adorable Nu Mou. Other new features include nine new dungeons and a new series of end game raids. Crafters and gatherers will have the opportunity to come together and use their skills to rebuild the Holy See of Ishgard. A feature akin to Final Fantasy XI’s Trust system will be added in Shadowbringers, allowing non-player character heroes to accompany players through dungeons. This will allow players to play through the story scenario of the expansion completely solo. New game plus! Players will be able to go back and play older storylines with their current, ridiculously overpowered characters. On the technical side of things, a new world transfer system will allow players to move freely between any server in their data center. Players visiting other servers will be able to complete all quests as if they were on their home server. The world transfer system will be released before the expansion in order to iron out the kinks pre-launch. Europe and North America will soon get new data centers to help handle an ongoing influx of new players. More information about Shadowbringers and update 4.5 will be revealed over the weekend during Fanfest. Stay tuned to the official Twitch channel for more.